Fat Free Samosa (due in 2018) (Author and Creative Designer) Published by Surmrit Gallery of Art and Design, New York. Creating Durga (2013) (Author and Creative Designer) Published by Surmrit Gallery of Art and Design, New York. Smrita Jain (born January 31, 1983, in New Delhi, India) is an award-winning Indian designer, artist, photographer, poet, author and design educator currently living in New York City. She has authored and designed two books, Fat Free Samosa (due in 2018) and Creating Durga (2013), both published by Surmrit Gallery of Art and Design. Her art has been showcased in New York, London, and India. A cultural documentary photographer, her first book, Creating Durga, gained international recognition and a second, an autobiography called Fat Free Samosa, is due for release in 2018. Smrita was the keynote speaker at KADLondon2017, a creativity conference, and has also spoken at Global Status of Women and Girls. She has exhibited at Pratt Institute, Javits Center, Queens Museum, The Juliana Curran Terian Design Center Pavilion, The Arthur M. Berger Art Gallery, and The Nehru Center London. 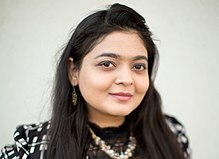 As a designer, Smrita has worked with the likes of Wilbur-Ellis, Financial Accounting Foundation, Ernst & Young, WebMD, Manchester Designer Outlets, Google, JDRF, Tyco, Rockefeller Center Collaborative Research Center, NASCAR Hall of Fame, Ministry of Indian Tourism and Supreme Court Museum of India. She has won several awards from, among others, GDUSA, Creativity International, Summit International Creative, London International Creative, and Design Firms. After finishing an undergraduate degree in Bachelors in Design with a major in Graphics in 2005 from Apeejay Institute of Design, Smrita worked with Design Workshop, an advertising agency based in Lajpat Nagar, New Delhi. In 2007, she entered Pratt Institute, NY in 2007 in the Masters in Science for Communications Design program, graduating in 2010. Established with headquarters in New York, The Aquario Group (TAG) is an internationally recognized strategic communications firm specializing in design and marketing with its second location based in New Delhi, India. This year, Smrita was named a Design Leader by the AIGA. Smrita formed TAG to be ethically centered, creating no partnerships with firms and brands that harm life or the environment. Surmrit Gallery of Art and Design is an artist-led art gallery based in Brooklyn and Manhattan, New York. It was opened in Newport, Jersey City as the first private art gallery in the area in May 2014. Since its inception, the gallery has taken part in numerous art shows and has hosted many exhibitions around the world. 2017 Creating Durga, The Nehru Center, High Commission of India, London, UK. 2016 Art & Colors: International Contemporary Art Exhibition, curated by Zina Bercovici, Royal Opera Gallery, London, England UK. 2015 Alumni Exhibition, Pratt Manhattan Gallery, New York, NY USA. 2014 Group Exhibition Queens Museum, Queens, NY USA. 2012 Group exhibition, Contemporary Art Fair, at Javits Center, New York, NY USA. 2011 Solo Exhibition Pratt Manhattan Gallery, New York, NY. 2007 Beyond the Sea, Group Exhibition, Pratt Fine Arts Center, New York, NY USA. Creating Durga (2013): A photo book depicting India's Vedic culture, its deities and religious stories. Smrita illustrates the story of Durga, an important deity from North India, in both text and photographs. Fat Free Samosa (due in 2018): From a feature posted in The Citizen: "Smrita Jain in her book talks about the issues of fat shaming, bullying and marriage and her take on the same, the samosa representing a person's mind inflated with social filth. She writes about how racism, sexism, discrimination based on class and caste, and body shaming are social evils which fill up our minds with fat and grime. The book becomes her story about her life talking about growing up in a conservative environment in India and moving to New York, which also had its challenges, a city which changed her perspective towards life and its nuances." Smrita's personal work is deeply infused with a positive feminism and empowerment. In an interview with Sakhi Magazine Smrita explained why she needed to create her book Fat Free Samosa realizing "there are so many issues of race, caste, and creed in our society that I felt a strong need to tell my story. Buying a fat free salad dressing is not enough to keep yourself fat free. There is fat and grime (racism, sexism, discrimination based on caste and class, rich/poor comparison, fat shaming, body shaming and many other issues) in our minds and souls that needs to be eradicated." The website Feminist Wednesday invited Smrita Jain to share "the ways in which her art has allowed her to overcome experiences which have kept many women silent, and reminds us how valuable our voices can be for someone in need." In an interview with Ask Artists Smrita discussed independence from an early age noting "I always had an independent way of thinking, coming to my own decisions and conclusions. Smrita Jain spoke at the Global Status of Women and Girls Conference at Christopher Newport University in March 2017. She presented a talk on Understanding, Defining, and Preventing Dating and Domestic Violence. In September 2017, Smrita Jain was the keynote speaker at KADLondon2017, a two-day creativity conference held at The Nehru Center, London, UK, a cultural wing of The High Commission of India. She began the evening with her paper on the interaction between art and design and its value in cultural representation. Each case study she presented offered a different perspective and broke stereotypical impressions of the Indian culture. In March 2018, Smrita Jain was invited again to speak about Art and Activism in India how it is failing at Christopher Newport University at Newport News Virginia. ^ "Graphic Design Award: Winner". DesignFirms. Retrieved 28 September 2016. ^ "Publications". Surmrit Gallery. Retrieved 16 August 2016. ^ "Keynote Speaker". KADLondon 2017. Retrieved 4 April 2018. ^ "2017 American Graphic Design Awards". ^ a b "47th Creativity International Award GOLD". ^ a b "Silver Award in Government Marketing Category". Summit International Creative. Retrieved 4 April 2018. ^ "London International Creative HONORARY MENTION, January 2016". ^ "Design Firms, Graphic Design FIRST POSITION, March 2016". ^ a b "Pratt Alumni Day Gallery Guide". Pratt Institute. Retrieved 27 September 2016. ^ "About Us". The Aquario Group. Retrieved 27 September 2016. ^ "Blog". ForJ Marketing Blog. Retrieved 16 November 2016. ^ "New art gallery opening in unexpected neighborhood in Jersey City". www.nj.com. 20 May 2014. Retrieved 24 March 2017. ^ a b c d e f "Behance". Behance. Retrieved 2 November 2016. ^ a b "Kaleidoscope of Art and Design". ^ "Last Exhibited". ArtRabbit. ArtRabbit. Retrieved 28 September 2016. ^ "Community Partnership Exhibition Program: Erasing Borders 2014". Queens Museum. Retrieved 27 September 2016. ^ "Prattfolio Fall/Winter 2011". Pratt Institute. ^ "Designer Profile". AIGA (American Institute of Graphic Arts). Retrieved 27 September 2016. ^ Jain S, Smrita (March 2013). Creating Durga. Surmrit Gallery of Art & Design. p. 111. ISBN 0988600404. Retrieved 4 October 2016. ^ Sarah, Ahmad. "East Side Story". The Citizen. Retrieved 2 November 2016. ^ Wadler, Kelly Anne. "Shine On Radio with Kelly - Find Your Shine! : Recipe for Fat Free Samosa with Empowerment Artist Smrita Jain". transformationtalkradio.com. Transformation Talk Radio. Retrieved 5 February 2017. ^ "Sakhi Interview: Artist Smrita Jain". Sakhi.com. Retrieved 5 February 2017. ^ "Inspiring Interviews: Meet artist Smrita Jain". Feminist Wednesday. Retrieved 4 February 2017. ^ Travers, J. (14 March 2017). "Smrita Jain: "A Beautiful, Indispensable Obsession"". Ask Artists. Retrieved 28 March 2017. ^ "Global Status of Women and Girls". Global Status of Women and Girls. Retrieved 24 June 2017. ^ Jain, Smrita (25 March 2017). "Smrita Jain at Global Status of Women and Girls Conference at CNU, March 25th 2017". YouTube. Christopher Newport University. ^ Jain, Smrita. "Art and Activism". YouTube. Christopher Newport University. ^ "Art Is My Cocaine". ^ Jain, Smrita (21 March 2018). "Gender and Art". YouTube. Christopher Newport University. This page was last edited on 11 February 2019, at 12:26 (UTC).